Tom's Erard harp is a Grecian model, double-action, with 43 strings. Designed for a salon setting, this particular instrument was built in 1829, and was first owned by a Mrs. Morgan of Wales. 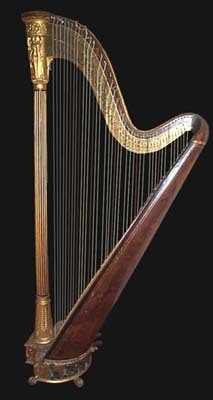 Most of the fabric of the harp seems to be original, except for the soundboard; the original soundboard was quite fragile, and despite the harp's being light-strung to reduce the strain on it, it eventually cracked, and was replaced by harp restorer John Page. The harp is still in good playing condition, and Tom often plays it during his professional engagements. It appears in the video for Florence and the Machine's Rabbit Heart.